2010 has just dawned upon all of us and we Indians would be the lucky ones to catch a glimpse of the first Solar eclipse of this year. On January 15, we would be seeing an annular Solar eclipse in our skies. Unlike total solar eclipses, it won't have the diamond ring. Instead, there will be a gold ring around the Sun because the moon would be too distant from the earth to be able to cover the sun completely. This would also be quite a long eclipse and is expected to last over 10 minutes. It is expected to begin by 13: 23 IST, and will last for around 10.4 minutes. If you happen to be somewhere in the Indian Ocean, it will last a minute longer and continue for 11 minutes and 7 seconds. 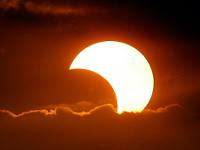 or Mizoram (we know Mizoram is quite far from South India), the Annular eclipse should be quite a feast for your eyes. Annular Solar eclipses are rare and the last one to happen in India was when were fighting the second war with Pakistan in 1965; November 22 to be precise. Also, the next Annular eclipse is scheduled only in 2020, so you better watch it this time or wait for a decade to pass. In other parts of India, the eclipse would be a partial one. However, even the next partial eclipse will happen six years from now - so you might not want to miss this one on Friday! Thanks for the information. I am preparing for the event.